This poor, sweet, deluded child. I have them all fooled. FOOLED, I TELL YOU. 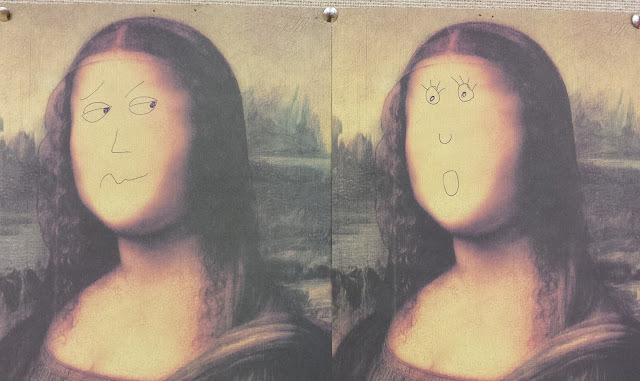 Last week a kid and I had some fun with blank Mona Lisa faces. Can you guess which one is mine? Came out to the kid's reference desk and saw this sign taped to the computer and now my life is complete. 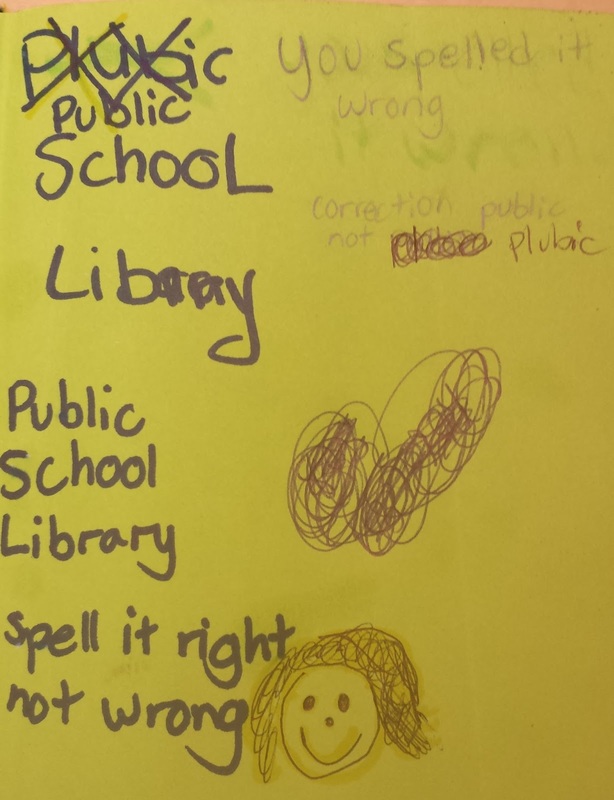 I asked the kid who made it WHY he made it and he simply said "Because people should appreciate librarians." Me: "No one told you to make it?" Kid: "No. 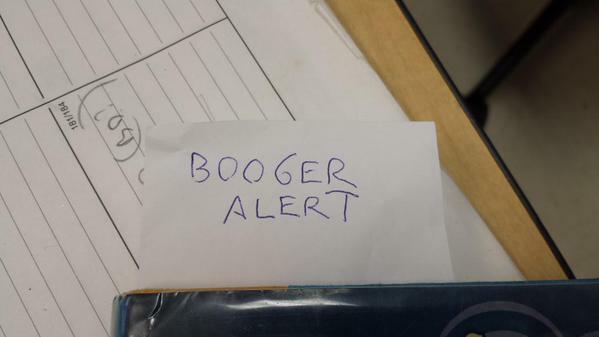 I also made one for the security guard." Which he did. Sometimes I have no words, guys. This is the kind of thing you find when you investigate a shoe box full of old photos in your library's basement. Me to kid: "I like your Harold and the Purple Crayon t-shirt!" 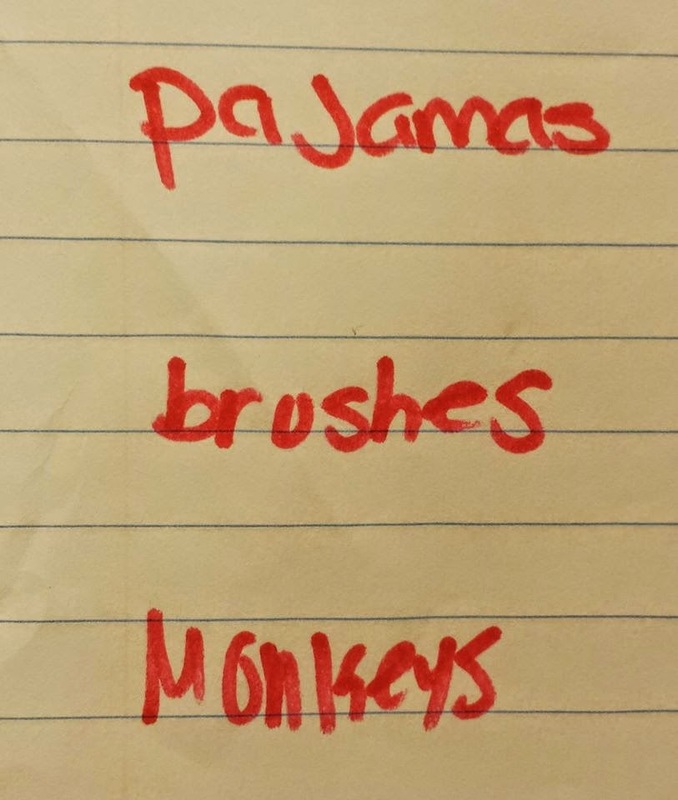 Kid's mom: "He also has a Corduroy one. I think he likes Corduroy better." Kid's older brother: "Harold is crap, Corduroy is great." The other week I received this lovely mention on Twitter from a lovely Twitter friend telling me a lovely thing. Seriously, how great of a surprise is that? Unexpected books! They arrived recently and they look just wonderful. 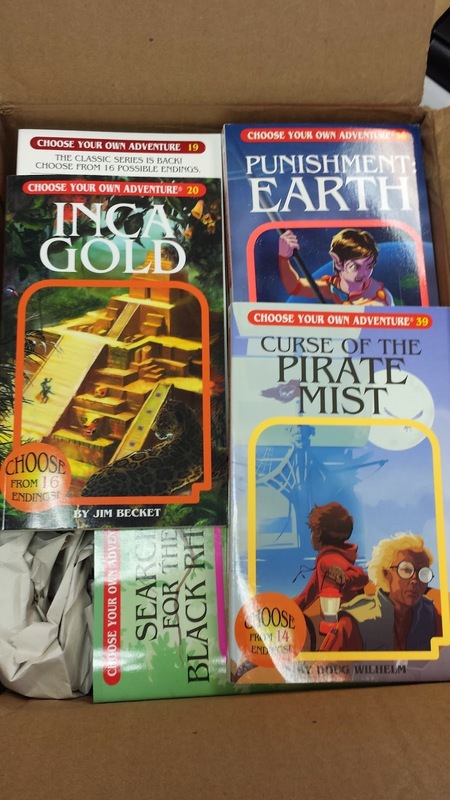 So I just wanted to publicly thank Mary (and the "Choose Your Own Adventure" people) and for making my day a little brighter - and, by extension, making the kids at my library a little happier too. 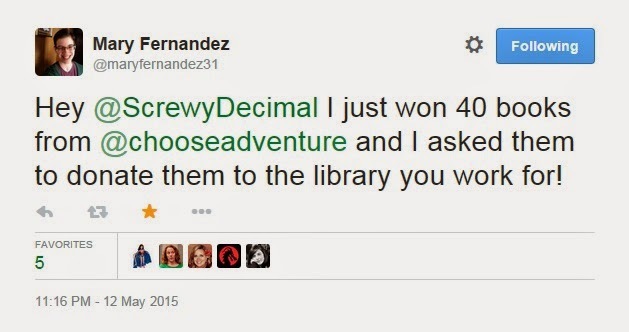 Hooray for random acts of bookish kindness! 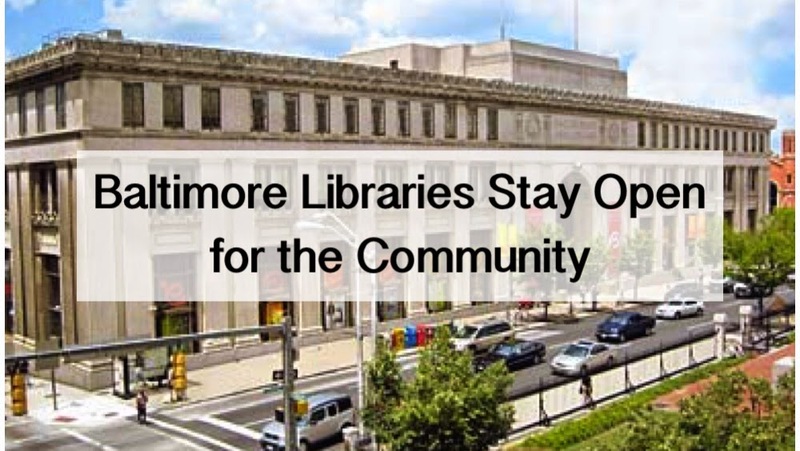 Hey guys, here is a post I put together over at Book Riot about how Baltimore libraries stayed open despite protesting/riots and included information about what you can do to support the libraries and their staff. 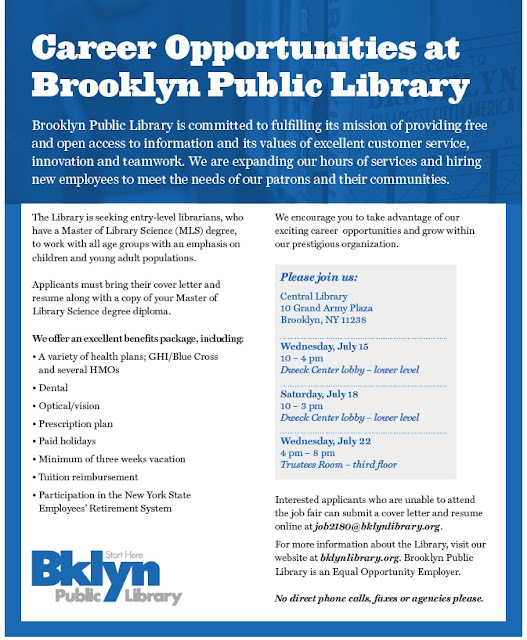 Thanks for supporting libraries near and far, everyone. 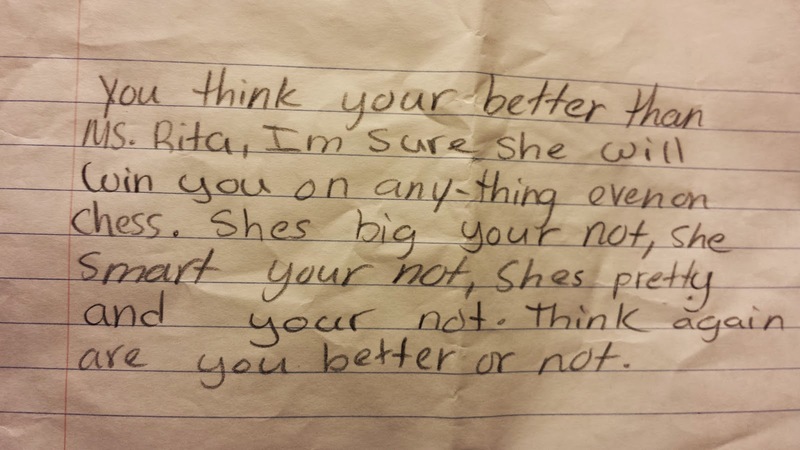 The other day a kid (one of the library regulars) showed me a short story she had written in school and we talked about it (it was actually pretty dark, but that's a tale for another time). Later that afternoon, after she had finished her homework, the kid came up to me and told me she was bored. There were no programs going on at that time, so I said that she should write another short story. "What should I write about?" she said. 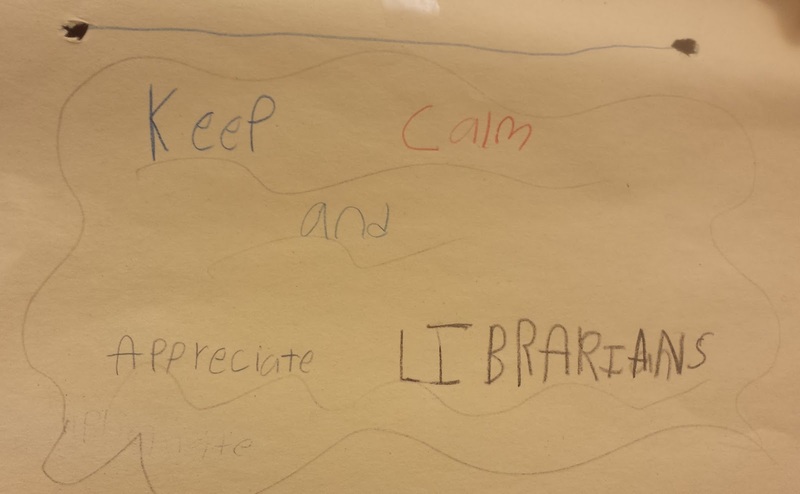 "An awesome librarian," I joked. I asked the kid who the narrator was talking to, and she shrugged and said "no one, really." Even though I've never played chess in my life (and obviously we need to work on the "your vs. you're" thing), I told her I appreciated the support and that I hope she keeps writing. Someone's got to do it! Here's piece I wrote for Reading Rainbow: "A Writer & Librarian on How (& Why) to Surround Yourself with Books"
Here's a post on Book Riot about #WeNeedDiverseBooks featuring some awesome teens at my library (as well as the work of my awesome colleague Katya): "We Need Diverse Books: Real Teens Have Their Say"
Kid: "Will you still be a librarian after you get married? Kid: "You won't stay home and take care of the children?" Me: "I don't have any children." to do the night work." Well, looks like THAT'S sorted. Who says you can't have it all? Hey, guys! I just want to share some quick (and AWESOME) news! Some of you may know that I wrote a picture book manuscript called Edward Gets Messy and, with the hard work of my wonderful agent Brooks Sherman, sold it to Simon & Schuster Books for Young Readers this past June. The book is slated to be published in the summer of 2016. 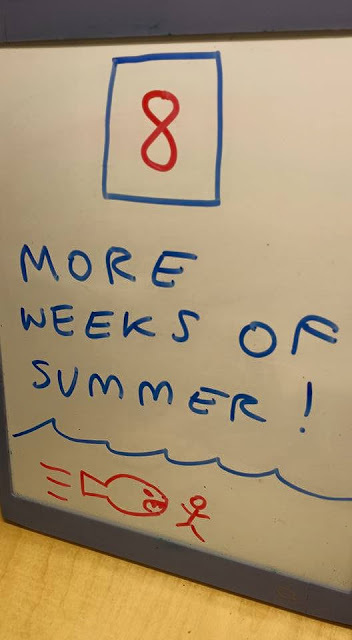 To me, this sort of feels like it's a million years away...BUT an important step in the process has been taken! I'm honored and excited to tell you that Olga Stern has been signed to illustrate Edward! I adore her artwork (it's certainly better than mine) and I can't wait to see what she creates for this little story. I'll be sure to share more updates as they arise. Thank you to Olga, to Brooks, to Kristin Ostby (my editor at S&S), and to everyone else who has supported this project along the way. Found this list in the library. I'm not sure what it's for, exactly, but I HOPE it's for a party, and I hope that I'm invited. I've been seeing a lot of weirdness on the internet today about how society is "doomed"
of anyone who does not know who he is or who says that he's maybe not relevant to kids today or even JOKES about it. I got a little curious myself, so for fun, I did a quick, informal, totally unscientific poll of some of the kids currently hanging out in my library on this slow-ish, rainy Saturday. Me: "Do you know who Paul McCartney is?" One of the girls: "I've heard of him." Me: "Do you know what he does?" One boy made a weird "I have no idea" face and the other said "He's an author, I think?" Me: "Do you guys know who Paul McCartney is?" "He's some singer. And he's old." In conclusion: WHO CARES? I love the Beatles myself, but this is not a signal of doom. It's not really a signal of anything except the fact that time moves on for everything. Times change, tastes change, kids get new musical heroes, and that's okay. At the very least, stop (seriously, anyway) fighting on Twitter about it and harassing random people. I think we need to just *let it be, everyone.